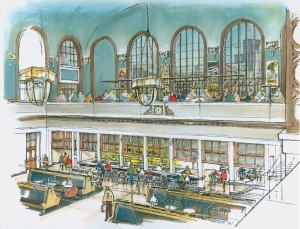 Union Station Neighborhood Company, a joint venture between East West Partners and Continuum Partners, announced their plans for the historic Union Station building today. The plan includes activating the historic station, returning it to a transportation hub, giving life to the public plazas and serving the neighborhood. One of the main goals is to make the new station financially independent. With all of those goals in place, USNCo. designed a market, a couple of restaurants, the Amtrak ticket office, retail kiosks and a sitting area in the train hall. I believe this is an incredible use of the space and will help bring Union Station back to the bustling transportation hub it once was. Click here for more details and a few renderings.